What: "End the Silence, End the Violence"
Blue Lotus Speaks is a new program that has been developed to assist those living with and healing from sexual assault. The program is based on Tchiya’s own journey back from sexual assault experiences that occurred back when she was a grad student at UT Austin 1983-1984. At the time, she said nothing and never really talked about it..
June 7th marks the 13th anniversary of Tchiya Amet Day in Austin, TX and 2014 marks the 30th anniversary of the crime. In some cases, it takes a long time to feel strong enough to speak up and to take action. Tchiya was recently advised that she can be sued for defamation of character if she talks about the encounter. But, that is the whole point: NO FEAR ABOUT SPEAKING OUT!!! Being able to speak out and help others is her medicine. Tchiya lived in Austin until 2001, when she and her family moved to California. As a step forward in her healing journey, she realized that it was time to return to Austin, and also time to help others, using her talents in music and sound healing. 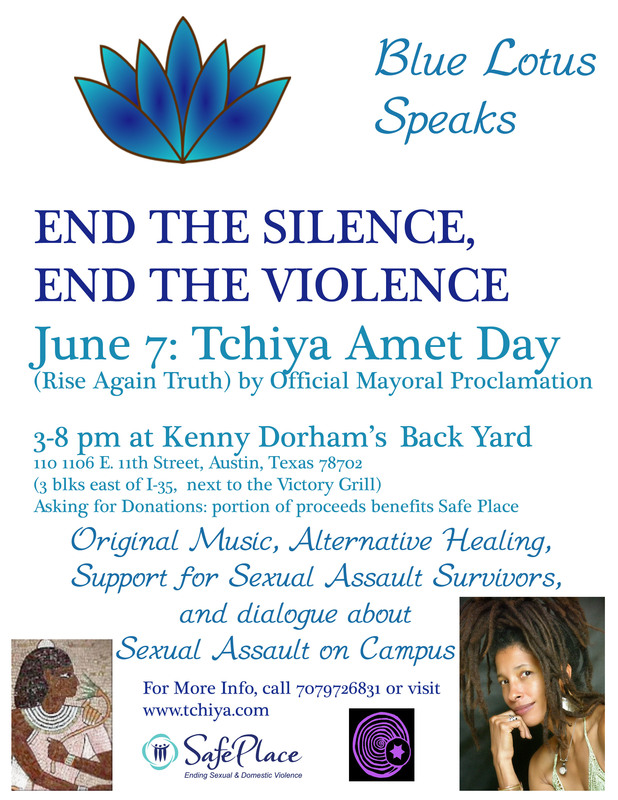 "End the Silence, End the Violence" is the first in a series of musical wellness events that will include live music performances by Tchiya Amet, solo, and also with special guests and friends. There will be a Healing Arts presentation on healing from trauma and self care by Tchiya Amet El Maat (Cosmic Sound Healing with Acutonics ©) and other healers tba. There will be group healings as well as opportunities for mini treatments there at the event, or one-on-one later in the week. Another feature of this event will be a panel discussion about Sexual Assault on College Campuses. Tchiya Amet Day! The Blue Lotus Speaks: End the Silence, End the Violence. June 7 and everyday.